In my article AvaStar Tutorial: Adding the Slink Model to AvaStar I provide the steps to get the Slink Mesh Dev Model updated in AvaStar 2RC5. Slink has been handing out a model made with AvaStar 1.1.34. So, there are a lot of AvaStar updates between that and 2RC5. Enough so that 2RC5 can’t update that old a rig. Posted in Animation, Blender, Clothes Skins Etc, Mesh, Second Life. Tagged Avastar, Slink. Update 5/30 – I’ve run into a similar problem updating from 2.0.30 to 2.0.46 (2RC8). Working on that fix now. Update 3/24 – AvaStar 2 RC 6 fixes part of the problem previously reported. But, it does not yield a working rig. You still need to follow this process to update the rig 1.1.34 version to 2.0.45. Update: 2017 – As I used the Slink model I had updated, I found some problems. So, after more testing and a back and forth with AvaStar/Machinimatrix, I pulled the original of this article the day after I published it and rewrote it. Slink provides a developer’s kit labeled Slink Creators Kit March 2016. 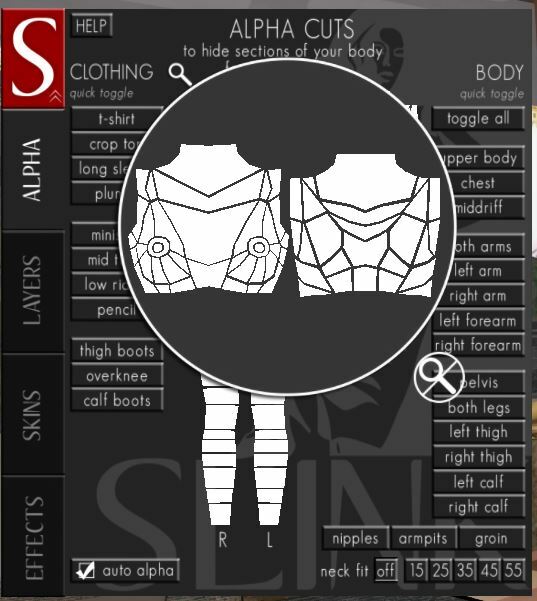 It contains all the models needed to make shoes, pants, dresses, and shirts for Slink’s Physique and Hourglass. Both male and female models. There are blend, dea, fbx, and mb files for import to various modeling programs. The file is an older version made with AvaStar 1.1.34. So, the rig in the blend file provided must be updated. I’ll step you through the process. The video is handy, but unrelated to the rig update process. The first step in developing for Slink, or any brand of body, is applying for the developr’s kit. In the case of slink it is the Slink Creators Kit. Apply here. Let them know you want to develop mesh clothes. Only ask for one kit at a time. Otherwise, you won’t know which ONE they will choose to send you. The kit will arrive in-world and the model files by via email. Posted in Animation, Blender, Clothes Skins Etc, Second Life. Tagged Avastar, Slink. And wow… it is an update… no additional cost… WOW! Posted in Animation, Clothes Skins Etc, Fashion, Second Life. Tagged Bento, Slink. Mesh development is shaking down into some common methods. 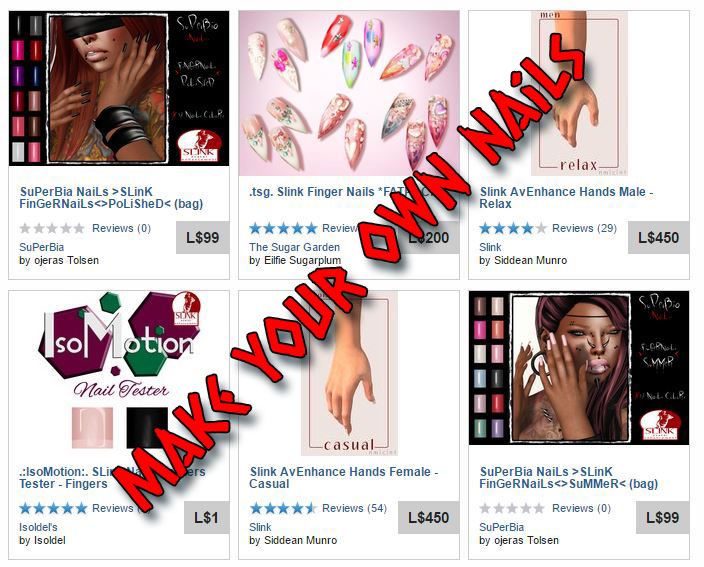 This tutorial covers how to make Slink Nails using 2017 information. Section headings will give you an idea of what you can skip and what you need to read based on your experience level. If you are totally new to Second Life™ there is a lot to learn. I am only touching on the parts needed to make nails for Slink Hands. Other brands of hands are similar. In 2013 Linden Lab, owner of Second Life (SL), added a feature we call ‘mesh’. Prior to that all things in SL were made of primitives, shortened to ‘prims’. Technically everything in SL is a primitive and made of mesh. Posted in Clothes Skins Etc, Mesh, Scripting, Second Life. Tagged Mesh Tutorial, Slink, Tutorials. Today Slink has released an update to their release of last week. Apparently, somebody found a bug… or two. Probably Whirly… Whatever, Siddeon released the fix and a bit of an upgrade. I got mine today. So, I have a new body for the new year. The upgrade is the addition of a magnifying glass to make setting the upper body alphas easier. Visit the Slink store (URL) and click the update kiosk to get your new update. Posted in Clothes Skins Etc, Fashion, Second Life. Tagged Slink. I missed the video Siddean Munro made showing off the new features in version 3.0 of Slink Bodies. So, here it is. Siddean doesn’t get into the Auto-Alapha thing I covered in the previous article. There is another video for the male body. The formal announce by Siddean is here: Slink – A huge update!! Today I got a notice that Slink updated their Physique, Hourglass, and Male Physique bodies. The update is free. Visit the store and click the Re-delivery terminal. You’ll be sent to a web page with a list of the Slink things you have purchased. You’ll get a new copy of your Slink body. I was using a body labeled v2.8 and a HUD labeled v2.7. They say this new body is compatible will all the stuff I bought for Slink so far. The biggest visual changes are in the HUD. It is now 4 panels instead of the single panel with everything in one place. There is now a panel for; Alpha, Layers, Skin, and Effects. Posted in Clothes Skins Etc, Fashion, Mesh, Second Life. Tagged Slink.